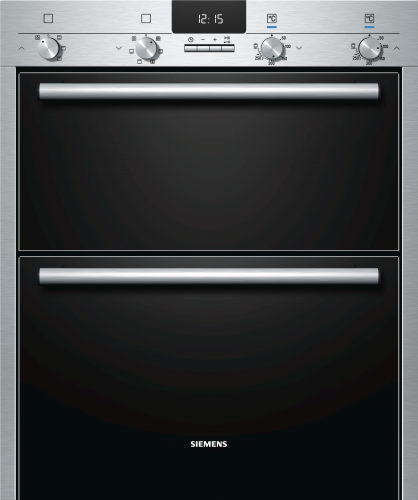 Perhaps less common in modern kitchens, the HB43NB520B is a built-under double oven, which means it is situated underneath a worktop as opposed to in a tall unit. Everyone’s tastes are different of course, and this option appeals to those who prefer a more traditional layout in their kitchen. Let’s begin with the most basic feature; an absolutely modern clock and timer. This isn’t your grandfather’s egg timer! Fully customisable with colours and designs to match your kitchen. Naturally you can count on the accuracy of this timepiece, too. Tired of cleaning? Who isn’t? People who have an ecoClean coating inside their ovens. Good news, this one comes complete with this luxury addition! No more scrubbing, no more smelly chemicals, and no more worn out knees. Okay, now this one is truly amazing. You thought that a double oven meant you can cook two items at once, with different temperatures, didn’t you? Well you’d be wrong! In a good way! Thanks to 3D Hot Air technology you can cook THREE different dishes simultaneously… The main oven has the ability to heat each self completely independently using the power of highly directional air flow. You can even cook a potent spicy dish alongside a spongecake, and never shall the two affect each other.